So I have had my lab hosts for about a year. I have to say that they have done pretty well. Because of the cost I configured these hosts with 16GB of RAM each. At the time I built them, 8GB sticks of RAM were about $250 a piece, which was a little bit out of my price range. I recently found some 8GB Kingston memory that wasn’t going to break the bank, and give me the ability to do more than I have been able to. The initial configuration included the following components, and cost around $1,650 ($825/host) not counting shipping/etc. A year later some prices have changed, some additional processors are support on my boards, larger memory is a little cheaper, and SSD prices have declined. Both are very similar configurations. The only differences are choosing an Intel E3-1230 v2 (Ivy Bridge) and larger sticks of RAM. The cost ends up being $121.96 less for the 2012 configuration. But… The 2012 configuration has 2 EMPTY memory slots. Now the difference between the 2011 (16GB) and 2012 (32GB) configurations is $198 more. Just for grins, I wanted to see what the exact same configuration (2011) would cost today. So in just over 12 months, to build 2 systems exactly as I did in 2011, it would cost me $182 less, or $91 a host less. The biggest changes in prices between 2011 & 2012 are the SSD drives and RAM cost. Drive prices always drop (until there is a flood somewhere) and RAM prices seem to drop to a point, then become expensive again when the demand drops. Keep in mind that these hosts cost what they do, because they are server boards and ECC RAM is being used. I really wanted iKVM access, as well as remote turn on, which these boards provide. I also have a complement of 5 useable NICs, which may or may not be necessary, depending on what you want to do with the lab. The budget configuration could still be expanded to 32GB of RAM, additional NICs could be added (remember 3 useable onboard), and a SSD drive could be added for vSphere 5’s Host Cache feature. The Intel Pentium G620 processors support VT, but not VT-d, and don’t have nearly the same horsepower as the E3-1230’s. But in a year of using the lab, only seldom do I ever get to a point where CPU is a point of contention. I might just have to look into expanding the lab. Update: I forgot to mention, I’m loading ESXi on Sandisk Cruzer Fit 8GB USB drives from Best Buy at $7.99 each. Update 2: Here is what the header pin-out looks like, for those with questions on getting it working (took me a couple tries). Now to figured out how I can put together a VNXe with COTS parts… LOL. Do you think that G620 CPU has any feature differences? I want to use this lab for full VCP5 exam prep so want to make sure all features are available, do you see any problem if I use this CPU instead of the original one you quoted in your other blog? The G620 doesn’t support VT-d, and there are few other differences. 1) The power adapter 4pin to 8pin connector you reference is not correctly linked above. The link is for a 8pin to 8pin extention cable. 2) The Tyan boards only support the Ivy Bridge processors with a BIOS update. 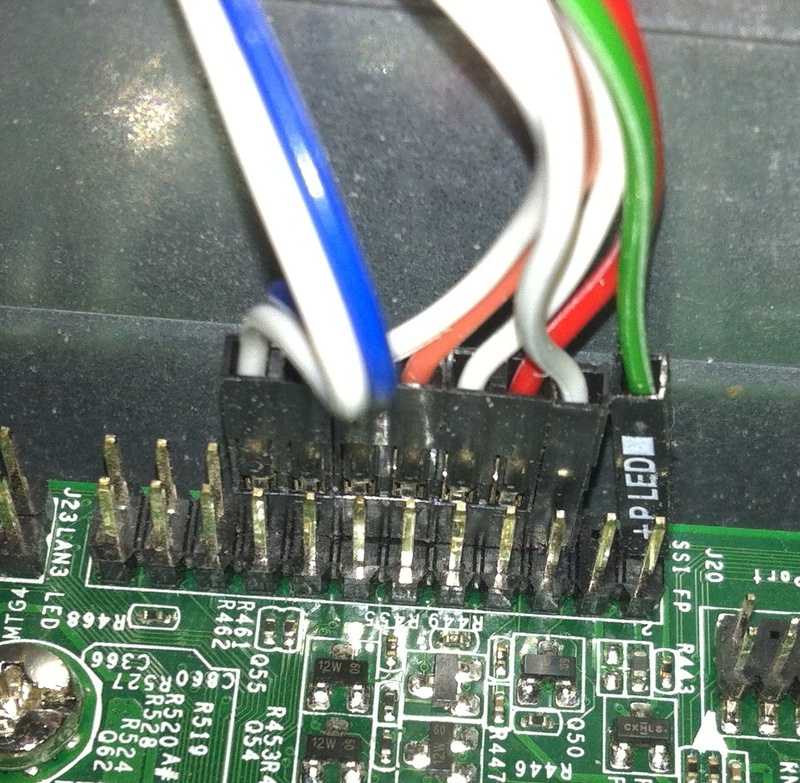 I put together a blog post on how to update the boards without getting them to boot via the iKVM Out-of-Band access. Thanks for putting this together, it’s a great setup. Running smooth so far. I’ll try to get the link updated. But… My boards are not on the HCL, and work fine. I picked my boards for many reasons, including the fact that they had the same chipset as the Intel SB1200 boards (C204 on mine). Just wanted to say a big thanks for putting these articles up for those of us wanting to do whitebox VMWare installs! One question – I ordered basically your whole 2012 setup (Tyan MB, E3-1230, Kingston ECC 8GBx2, Rosewill R379-M, Athena cable) and I am getting a blinking green LED on Tyan and no power at all. I figure either I have borked the front panel wiring since the Tyan header pins aren’t clearly defined in the manual, or the comment about the “other” power adapter cable means that the Athena isn’t the right one and I need the Rosewill in Kevin’s post. What’s the proper panel-to-header wiring and does the Athena ATX/EPS work with this config? Thanks again! I just added a pic of the pin-out for clarification. Great… the Tyan manual is a little obtuse about the pinouts. That got the fans spinning up but then I had a loud repetitive beep beep beep. After playing around with several combinations of memory and USB keyboards, none of which relieved the beeping, I plugged into the network using the IPMI jack (the RJ45 above the USB ports on the IO shield). The IPMI interface pulled an IP address, which I was able to harvest from my router. Then using the IPMI web interface to update the BIOS – the board was shipped with 2.0 which doesn’t support Ivy Bridge CPUs such as your recommended E3-1230. After updating BIOS to 2.01b from the Tyan website, I am good to go! Great that really helped since the Tyan manual is pretty vague about the fact that all the pins should just line up on the outer edge of that J20 header. That got me to a point where the board and the fans would power up but give a constant beep beep beep. After swapping out memory and USB keyboards etc., I decided to give the IPMI a go. The IPMI jack is the RJ45 by itself above the USB ports on the IO shield. The router gave it an IP address, which I collected from the router interface. Then I browsed to the IPMI menu, updated the BIOS from the Tyan website (it shipped with 2.0 which doesn’t support Ivy Bridge and I’m using the E3-1230), and now I am good to go! <- Just approved the comment, showed up in Spam Filter. Again great work Charles!